Have you checked your fridge recently? 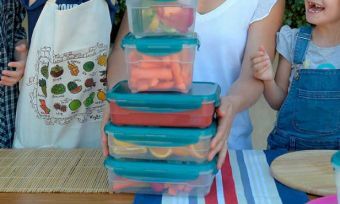 Health authorities have issued several warnings this week over a number of popular family favourites. Check the list below to see if you have any of the affected products to ensure you know what to stay away from. 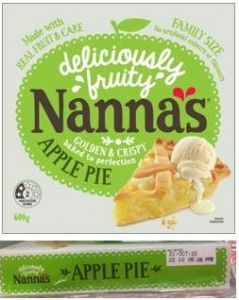 Major supermarkets across Australia are removing Nanna’s Family Apple Pie from their shelves after equipment failure by the supplier raised fears the product may contain glass. Health authorities issued an urgent national recall earlier this week and warned customers to return the item for a full refund. Patties Foods Ltd has recalled the product from Coles, Woolworths, IGA’s, Foodlands and various other independent supermarkets. No other Nanna’s products have been recalled. ALDI shoppers have been told to return Colway Real Mayonnaise after concerns faulty packaging may have contaminated the product with pieces of broken glass. There are fears the faulty packaging could result in injuries. 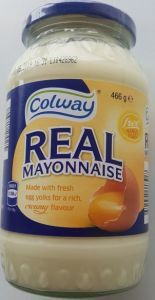 Authorities have issued the recall for all 466g glass jars of Colway Real Mayonnaise sold in ALDI stores. 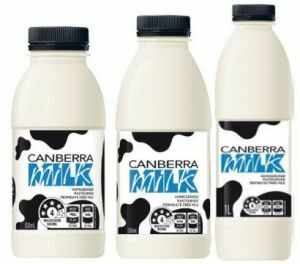 Canberra Milk Full Cream in 300ml and 500ml bottles. These feature a use by date of 5/11/2018, 8/11/2018m 12/11/2018 and 15/11/2018. Canberra Milk Full Cream in 1L plastic bottles. These contain a use by date of 5/11/2018, 6/11/2018, 8/11/2018, 9/11/2018, 13/11/2018 and 15/11/2018. The recall is due to a faulty seal on some of the black caps. The broken parts of those faulty caps may be found in the milk and may have the potential to be a choking hazard, if ingested. Another product recalled this week is Mini konjac jellies (Mini Cici Jelly and Mini Cici Jelly with dairy) sold from Asian grocery stores in NSW and ACT.